There was a long discussion on Motions for Convention at Monday night’s County Committee meeting. As usual, motions in relation to fixtures and competitions are dealt with at the final county committee meeting and many of the motions in relation to the various club championships fell following the earlier decision to support the recommendations of the County Championship Review Committee and play the Club Championships in April/May and the Senior Football Championship after Kerry exit the All Ireland Championship. Extra time will apply to all Round 1 games in the senior football Championship in an effort to avoid replays and the various Club Championships will now be played with four groups of four with the top team going forward to the semi final and the bottom team going into a relegation playoff. This format will give at least three championship games to each club. A motion from the Kerins O’Rahillys Club to increase the number of club teams participating in the senior football championship to twelve was defeated. A motion from Coiste Chontae looking for the Minor age limit to be reduced to 17 years for one year was defeated so the status quo remains in relation to minor league and championship. A motion looking for scoring difference to decide promotion and relegation issues in the senior football league was defeated and seven motions in relation to the Senior Hurling Leagues were deferred to the annual meeting of the Hurling Clubs with the CCC in the new year. 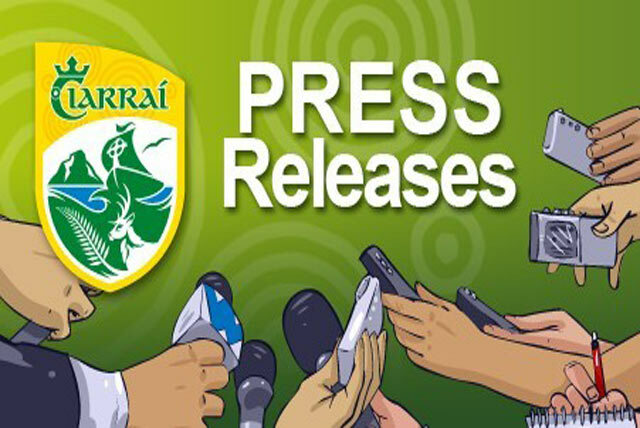 It is proposed to play the senior hurling championship during the Summer months of June, July and August. That the CCC look at the feasibility of introducing features outlined in (i) below into the 2018 Fixtures Calendar. That to facilitate these possible changes the CCC be given permission to alter (if deemed necessary) the present regulations governing the SFC by playing Rd 1 to a conclusion on the day and reviewing when Rd 11 of the SFL should be played. Play the Club Football Championship in one block during April/early May. Play the SFC in one block during Sept/Oct. (not including any qualifier game). Play the SHC within the period June/July/Aug. The Club Football Championships namely Intermediate & Junior Premier be played in a league format with four groups of four with the top team in each group playing in the S/Finals and the bottom team in each group entering a relegation play-off. Each team play one home game, one away game and one game in a neutral venue. CCC to draw up the rules and regulations required. That the Senior Clubs have the option to play the Senor Club Football Championship in its current format or use the same format as proposed for the Intermediate & Junior Premier (see above). That should the Junior Football Championship be played in the same format as proposed for the Intermediate and Junior Premier (see above), qualifying games if required shall be by a straight knockout, to ensure Rd 1 (involving a maximum of 16 teams) starts on the same weekend as the other Club Championship competitions. That the Minor County League & Minor County Championship be retained for 2018 and that the migration to the new structures, if applicable, takes place during next year for the 2019 season. That Kerry Co Board establishes a Sub-Committee to carry out an audit on all County and District Board competitions and make recommendations on what competitions if any could be streamlined, merged, condensed or discarded.